Heat a dry skillet. Add the cracked wheat and dry-roast, stirring constantly, about 5 minutes over medium heat. The wheat should turn a couple of shades darker. Remove to a plate and set aside. Add the oil to the skillet. Add the mustard seeds and asafetida. When the seeds sputter, add the onions and saute for a couple of minutes until the onions start to soften and turn translucent. Add the red chillies and turmeric and stir in. Immediately add the ginger and peppers and stir-fry a couple more minutes. Add the peas, water and salt and bring to a boil. Add the roasted cracked wheat and stir to mix, then cover with a tight lid, turn the heat to low, and allow it to cook for 15 minutes. Turn off the heat and let it stand about 10 minutes before opening. Garnish with coriander leaves or even some shredded coconut, if desired. 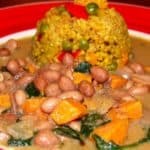 Serve hot with the peanut-veggie curry (recipe follows).